When I tell you that pom-pom accessories are all the rage right now, I am not exaggerating. 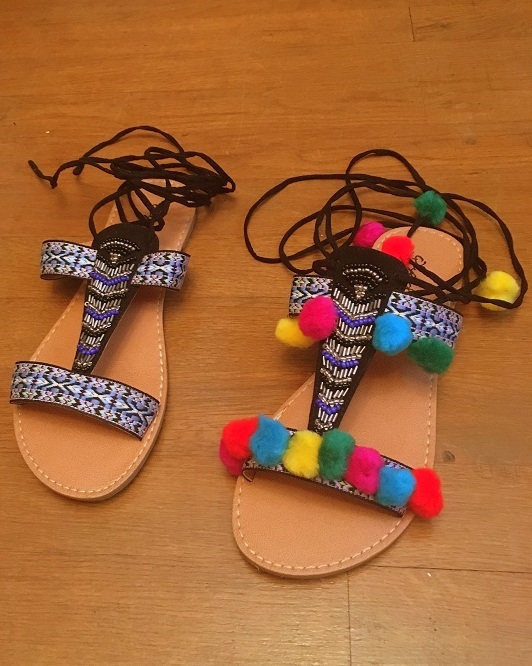 At the top of my wishlist for this trend were pom-pom lace up flat sandals - I needed them. But staying on trend, while staying on budget wouldn't allow me to shell out $80 (minimum!) for the pair that I really wanted. Instead I put my DIY mind (and recruited my super creative big sis for backup) to work and made my own very much loved pair. I bought these sandals from Amazon Fashion in June, and only wore them once during a beach weekend. Something about the print, mixed with the beading, mixed with the dark ties wasn't what I expected. They were $9 when I bought them, but even at $17 it's not a bad price for summer sandals. This was so simple! Tag me (@anucreature) on Instagram or Twitter with your adorable pom-poms! 1. First decide how you want to place the pom-poms. Consider pattern and placement to make sure you have enough pom-poms. 2. Thread your needle with about 13" of thread - you will need to re-thread after a few pom-poms, but anything longer will get knotted up. 4. Start your needle on a small section of the fabric overlay of the sandals and keep threading through the pom-pom core. Try to keep the thread on the underside so it doesn't scrunch up your pom-pom as you pull. 6. Continue on both sandals. For pom-poms on the laces, thread through middle but sew around lace up until it feels secure - create knot and tie. There you have it - glow girl!